confessions of a thinkaholic: Do You Need To Change The Station In Your Head? I was driving somewhere the other day and had the holiday/Christmas music on in the car. I am a self professed Yule-tide nerd. A softy in every way. It all happens the day after Thanksgiving, earlier if I could get away with it (like the day after Halloween) but I like to remember Thanksgiving and keep things decorated for Autumn. It's just a shame that the Christmas/Hanukkah/Yule holiday season only gets roughly one month. Almost not near enough time for all the songs, colors, decorations, smells, movies...well, you get the point. I was raised with Christmas being a big deal in my house. Mom loved it as much as Halloween (and that was a pretty big deal, too) and always went all out for it. That's where I get it from. I'm so glad I have Noah, he understands and loves it all as much as I do, and climbs up on that roof every year to cover the house in lights, not to mention the inside decorating he does, too. We don't really get caught up on labels, we just do what feel right to us and what makes us happy! Anyway, I was driving somewhere and was really needing to concentrate on getting there and the music was playing, something soothing and nice, probably White Christmas by Bing Crosby or The Christmas Song by Nat King Cole or even something by the Carpenters. Then, a more rambunctious song jumped from the radio's speakers and shocked me. I wasn't quite ready for that, and was very much needing to concentrate on what I was doing and couldn't with the song that was so raucously playing. I became agitated and frustrated and had to change the station to a more soothing and relaxing tune. After I got to where I was going, I got thinking about how I needed to quiet the outside noise so that I could sooth myself and concentrate and started to think about how that compared so much to how I need to sometimes do that for the internal noise, as well. Most of you know all about the power of positive thinking and the calming result of meditation, but how often do you actually practice it? Me? Not nearly as much as I should. Not. Nearly. I get so busy that I forget that there are wonderful opportunities at my disposal whenever I should need them, just waiting to be utilized. How busy do you get? Do you often have so many things on your mind that it makes it difficult for you to organize it all? Does all that "noise" in your head get in the way of your peace? I know mine does, which is why it is so important to remember that we have everything we need at our disposal. We so often look outward for the answers we seek: peace, love, joy...we might very well search forever looking outside of ourselves. One of the hardest things I had to learn on this journey was that everything I needed was right inside me all along. I just could not wrap my head around what on earth that meant. Thank goodness I found the forums and books and "teachers" I needed, when I needed them, to help me with this. When I was ready, I was open, and the answers came. But I had to quiet myself, first. I had to calm the noise and listen. When I changed the station in my head to a more calm and soothing one, I was able to concentrate on finding those things I was searching for, right inside me. I learned that I could attain peace with myself, that I didn't need to rely on outside influences or happenings to make me happy. It wasn't up to anyone else but me to bring the peace I sought. My choices, my behaviors and my thoughts were what brought the peace. Likewise with love and joy...it is really up to you. Learning to love yourself is a huge step for some. We often don't feel worthy of anyone else's love, let alone our own, but without self love, how can we ever give or receive outside love? And I also learned that I could give myself all the joy I was longing for. The biggest part of that was that I made the decision to do it. I put aside my ego, begrudgingly, I assure you, and I started making decisions to be consciously aware of my thoughts and judgments. That's a big one: being aware of your thoughts AND judgments, for when you are judging someone you become increasingly unconscious until it's a habit that becomes as second nature as breathing. You not only rob yourself of joy at this point, you rob them, too. I quieted that noise, changed the station, and just made it a point to concentrate on where I was going in my head--in my thoughts. It helped me to find that which I thought I could only find outside, but was within me all along. I will share more on this later this week as well as how to find peace during this busy season full of materialistic expectations when you may not be able to fulfill them. 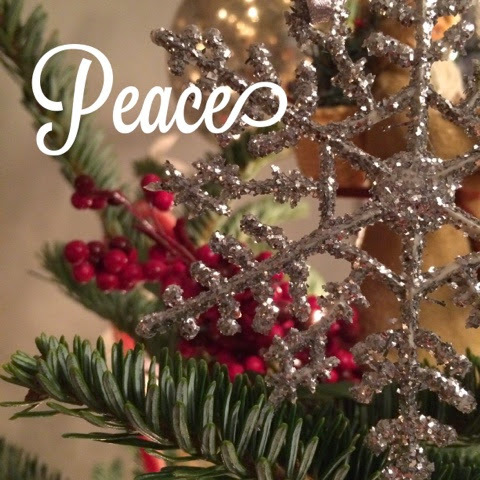 We could all use a shift of reasoning during the holiday season; a remembrance of what it should be about and how to find more peace among the stress. Thank you for being here today and reading, I so appreciate it.